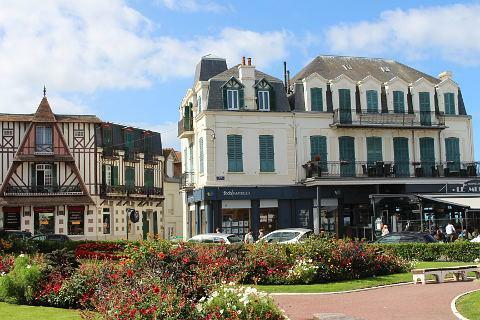 The town and coastal resort of Villers-sur-Mer is one of several popular resorts found in the Calvados region of Normandy near Trouville, on the Cote Fleurie in the part of Normandy known as the Pays d'Auge. 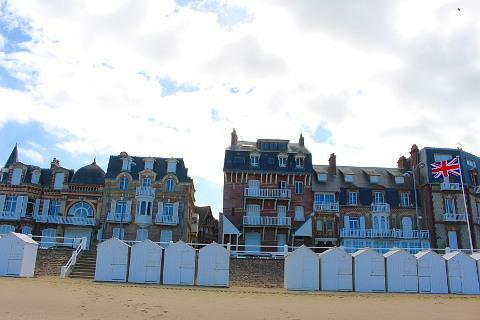 Like many of the resorts here it has its roots in the growth in popularity of coastal resorts during the second half of the 19th century, and there are various 'belle epoque' villas in the town that bear witness to the period, most notably behind the beach. 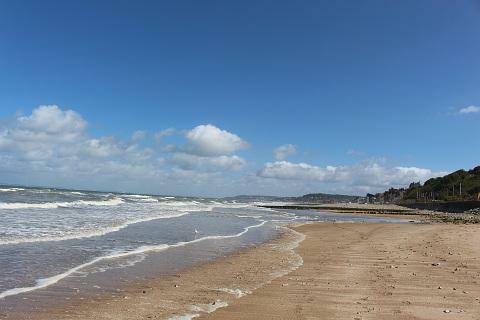 There is a popular beach in Villers-sur-Mer itself which is family friendly and backed by a pleasant promenade. 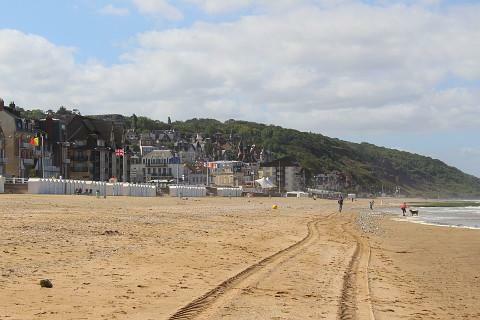 The two kilometre long sandy beach extends the length of the town, and continues to the east as the beach of Bonville-sur-Mer. 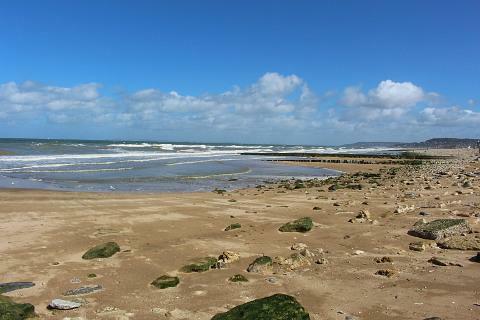 The beach is sandy, has a shallow entry to the sea, rolling surf and patches of stones which may contain fossils. What more could you want! 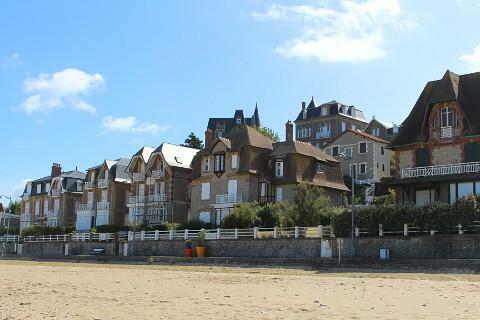 The two principal parts to the beach, Plage Jean Mermoz and Plage Jean Moulin, each have a dedicated car park and you can rent a beach cabin on Plage Jean Mermoz. The dramatic cliffs of the 'Falaises des Vaches Noires'* are to the west of the town centre and beach. These cliffs, that continue as far as Houlgate, are accessed at low tide. 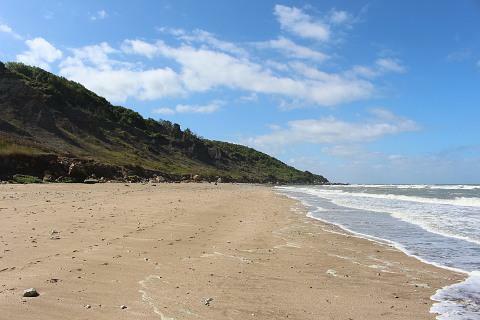 Very popular with fossil hunters, note that you can keep any fossil you might find in the sand but you are not permitted to hammer rocks out of the cliffs in search of fossils! *The Tourist Office in Villers-sur-Mer told us that the cliffs take their name, which translates as Cliffs of the Black Cows, from the large black rocks at the bottom of the cliffs looking like a herd of cows. 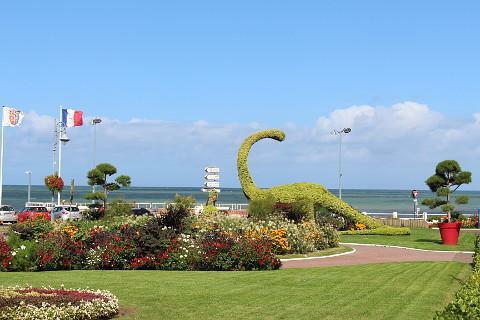 You can learn more about the fossils found in the area, including a fossilised sea crocodile at the Paléospace l'Odyssée. 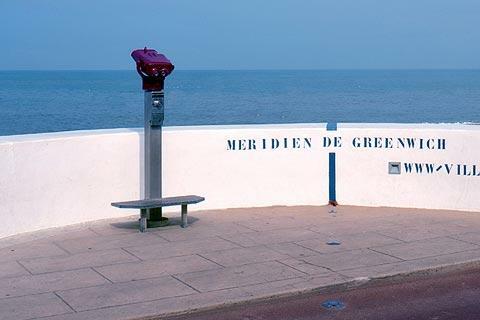 The museum also has information about the Greenwich Meridian that enters Europe in Villers-sur-Mer. 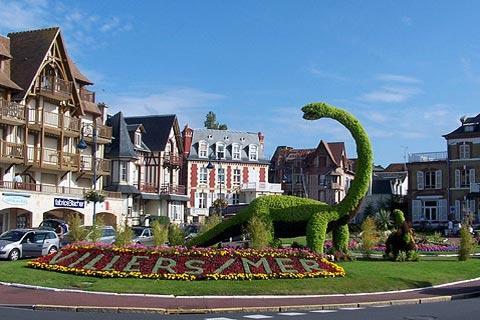 - the tourist office is behind the dinosaur! 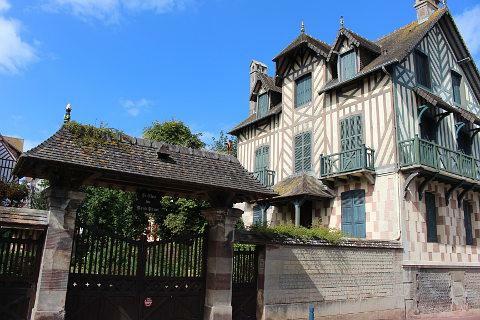 The tourist office have a map which shows the position of all 80 of the elegant villas in town but appeared unable to tell us which were the best examples or the best streets to admire a selection! - near to the dinosaurs on the seafront is a marker showing the location of the Greenwich Meridien - the point wher the longitude is 0. On the edge of town is the "Marais de Villers" an area of protected wetlands which is nice for a walk or a short bike ride. 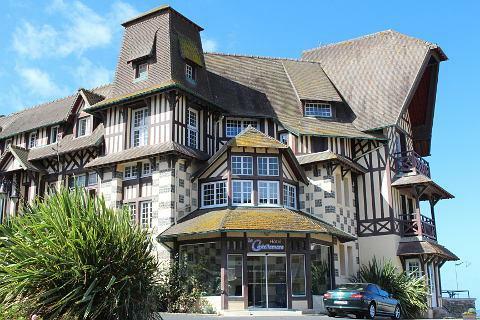 There are several other popular coastal resorts close to Villers-sur-Mer including Deauville and Trouville (our personal favourites) just a little way to the east and Houlgate and Cabourg towards the west. 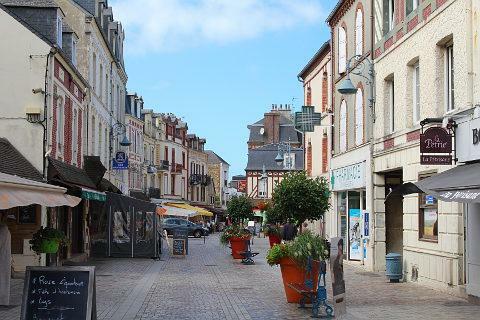 If you want to explore away from the coast we especially recommend Beuvron, a very picturesque village to the south of Villers-sur-Mer and a good starting point for the Normandy Cider route that pases through a great deal of attractive villages and countryside in the Pays d'Auge region.